Gill’s ‘Granny’s in the Pink’ is a Victorian style crazy quilt, made in memory of her grandmother. She explains crazy quilting and describes different aspects of the quilt, including embellishments which came from her Granny’s button box and a spider charm to bring good luck. Gill talks about her personal history with sewing, beginning in childhood, mainly self-taught dressmaking and quiltmaking. She also discusses changes to the sewing world and how she works today; current projects, technology, her design process and buying fabric. 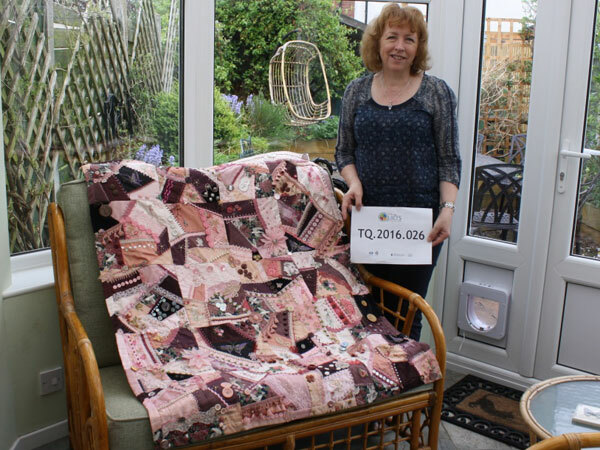 Denise Smith [DS]: Talking Quilts interview. Interviewer Denise Smith. Interviewee Gill Biel. We’re at the home of Gill Biel in Wolverhampton, West Midlands, and today is Wednesday the 11th of May, 2016. Hi, Gill. DS: Thanks for allowing me to come into your home to interview you about this… your quilt, today. We’ve got this lovely quilt in front of us. Would you like to tell us something about it? 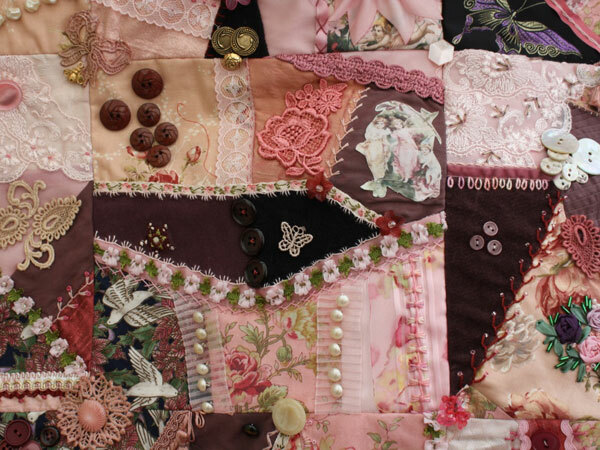 GB: Well, I would describe it as a Victorian-style Crazy Quilt, that’s mainly hand, hand-done. Saying that, it’s machine-pieced, but then there’s, sort of, absolutely loads of embellishments on it that… and embroidery, and beads and buttons and charms and some silk ribbon embroidery. In fact, every time I look at it myself, I forget what I’ve actually done on it, ’cause it, it was something that, you know, took quite a long time. Deliberately, because I wanted to have something that I could sit and work on, maybe, you know, on, on an evening when you’re sitting watching the television. I never like to watch television without something in my hand, so that’s, that’s really why I s, started it really. I, I, I saw… the inspiration came from, things that I’d seen on the Internet, and I just went from there, really. DS: How, how big is the quilt, Gill? GB: It’s [laughs], four… how big? 48 long and 38 wide. DS: And di… did it s… was it meant to be that size, or did it evolve and just grow? DS: You aimed for that size. DS: And did you, did you give it a name? GB: Yes. I called it ‘Granny’s in the Pink’, mainly because it’s mainly pink fabrics, and I dedicated it to my Granny, because most of the embellishments on there came from my Granny’s button box, which I’d sort of inherited after she died, and of course, when they’re in a button box, you don’t really see them, do you? So I thought, oh, it was a nice way of displaying buttons, and actually, say, the inspiration came from Sharon Boggins who’s apparently one of the world’s best crazy quilters, and she did a quilt in the year 2000 that she aimed to put 2,000 embellishments on it. That was the idea. It was called the Year, T… she abbreviates it as Y2K, but it’s Year 2000. I don’t know whether it was a competition or something ’cause I think she’s Australian, so, but she published e, e, every bit of her blocks, every week on the Internet, aiming to show a different embellishment and a different stitch. So it was her who inspired me really and then she… I think she called it ‘Who Dropped The Button Box?’, so there was lots of buttons on it, so I thought, ‘Ooh, I’ll use my Granny’s buttons.’ So of course, there are modern buttons on there as well ’cause I used my own buttons as well, but there are some, I can’t find them at the moment, but there are some Victorian buttons on there. You know, the little linen buttons that you put… used to put on petticoats and camisoles. There’s some of those on. These are sort of 1930s buttons. There’s lots of big, like, coat-type buttons. There I… there are some mother-of-pearl ones as well, somewhere, or I think there’s one… Oh, there’s one. One very nice… yeah, little mother-of-pearl. There’s one really nice… I’m not sure if that, that might even be silver, I don’t know. Just really any… I, I mean, some of them, you know, you wouldn’t think brown buttons would, would actually go, but I just wanted to show that you can use all different things, and it, it… as long as you put it together right, it look, looks, looks alright. DS: That’s right. Can you explain Crazy Quilting to us? GB: Well, Crazy Quilting isn’t, I suppose, isn’t quilting as we know it. For a, for a start, there isn’t a wadding, so it’s not actually wadded, but I suppose there are three layers, which is what a quilt is supposed to be, because you have your fancy fabrics laid onto a base, which is usually Calico. So you start off with a Calico square, lay your pieces on. You can either do that by hand or by machine. I did mine by machine, ’cause I actually like the quickness of putting it together by machine, but then I like the slowness of doing the hand embroidery afterwards. Instead of being quilted through, it’s tied in the… each… the corner of each of the blocks. DS: And how do you do that, Gill? GB: Just, all I used was a perlé thread. Again, I looked on the Internet to see how to do it, which is what I tend to do when I don’t know how to do something. You just literally thread the thread through and tie it in a knot. DS: At the front of the quilt? GB: At the front of the quilt. Some of them, I, I think most of them actually, I’ve then covered up with a button you know, in each corner. I have to say, I use buttons and beads a lot, because if the points don’t quite meet, it’s a good way of hiding it anyway. But then it looks a bit messy on the back, so I just put a back on, which is the third layer. But I did finish the border off a bit differently on this one as well. I actually carried the fabrics through, so I made the border up with the fabrics that are on the block, so that it gave a continuous look to the quilt, so it didn’t have a separate border on it. DS: Yeah. 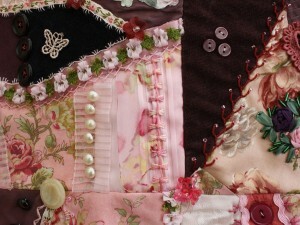 And are the, the fabrics that you’ve used in, in the quilt, are they vintage like the buttons? DS: Mm, that’s a lovely mulberry colour. A lovely mulberry colour that piece, isn’t it? GB: That… yeah, it is. And some of the others I’ve rescued from, you know, ’cause I have, I’ve done dressmaking all my life, so I have, you know, made dresses in the past, so there were a few… but then I just, I don’t remember that one was a new quilting fabric, but I bought it ’cause I liked the, the birds on it. DS: Yeah, and that’s blue with the birds on. GB: Yeah. That, obvious, again, is probably an old pair of trousers. I did like velvet in the ’70s [laughs]. But yes, yeah, so there are a few old fabrics. I mean, I would have loved to have used really vintage fabrics, but I didn’t have anything that was my Granny’s that I could cut up. That would have been lovely. GB: Yeah. Yeah. Some of it’s modern. No, a lot of it’s modern and, but some of it’s hand-dyed, so for example, that, those are, sort of, those modern daisies that you buy on a string, you now, but I’ve, I’ve, I’ve dyed them pink to match the fabric. DS: What sort of dyes did you use? GB: Probably silk dye, because it doesn’t have to be colourfast, because I know I’m never going to wash it and I’ve, I’ve sometimes even just used paint, like watercolour paint, you know, just to dab on and because I know it’s not going to be washed, because it, it, you know, well it can’t… I couldn’t imagine ever washing it. It’s, it doesn’t need to be colourfast. Some of the other le… oh, I mean, there’s even, like, bits of curtain braid and lamp shade trimming so it’s, it’s really just anything that I had. I went… if I, if I used to go to a haberdashers and I saw something that was pink, I bought it because I knew it would do on there. DS: And did people give you things to put on it? GB: Yeah, there was probably bits of donated lace, as well. In fact, I’ m trying to remember, I think this came from somebody’s bridesmaid’s dress, this, this one, ’cause it’s quite a nice lace. So yes, there probably were a few… I mean, people give me stuff all the time, so I forget who gives me things. DS: That’s right, yeah, and you’ve got some lovely ribbon. DS: There’s just the three there, isn’t there? GB: Yeah. I’m not sure whether I did any more silk ribbon embroidery anywhere. I did use silk ribbon, that’s silk ribbon. I do love silk ribbon, because it, it folds so nicely. DS: And the purple there picks up the purple in the butterflies. DS: A long time ago. DS: Well, it’s re-opened since, hasn’t it? GB: Yeah, but not, not fabric like, not dress fabrics as such. It’s only patchwork. But there’s some really nice buttons on there. GB: Oh, yes, now that was, I made those by gathering the rith, ribbon. DS: little flowers. Were they like a… what were they like, a peony? Not a peony. GB: Well, I suppose they are, yeah. Pointy, but I think it was a ribbon that you bought and you gathered it up, and it made the flower shape. DS: So lots of… and fairies. I’ve just found a fairy. GB: Oh, yes, yes. I did do a little bit of… that’s a computer image that I printed onto fabric, and then I’ve, and then I Bondawebbed it on [talking over each other] and there. There’s another one there. That’s one’s coming off a bit, but those I’ve stitched around. GB: Yeah. They are… there are an awful lot. I mean, those are some old… those are my Granny’s buttons. They’re almost black. GB: Victorian jet, sort of, buttons, aren’t they? And that one as well. Look at that one. GB: Yeah, and these. I love those. DS: Like black pearls aren’t they, almost? GB: Yes, yeah. And then there’s some modern buttons there. Little, little heart-shaped ones [talking over each other] that I’ve made into a flower. DS: And I can see a spider. And I’ve, sort of, heard about spiders being put on quilts before. GB: Yeah. Now you have to, you have to embroider a spider’s web, and put a spider on a Crazy Quilt. It was something I read about. Victorian crazy quilts always had a spider, ’cause it was supposed to be good luck. So whenever I do a Crazy Quilt now, I have to put a spider on. So I bought a little silver spider charm and embroidered a web. DS: So when you say, did Crazy Quilting start in the Victorian era, or was it before then and something they took on? GB: to show off their embroidery and then, then it became a crazy to embroider, like, family names as well, on… I’ve actually got an old quilt upstairs, eight, 1890s, that’s got family names embroidered in the patches. They probably weren’t as highly embellished as this. I just admit, I have gone a bit OTT with it, but it was probably more of the embroidery they used to show off, so each of the seams would have, like, feather stitch and all the, you know, all the fancy stitches, really. DS: So have you, have you got any hidden names or messages on this one? DS: Let’s have a look at the label. GB: Ha. I printed on the computer. I do regret doing it in pink now. You know what how hard pink is to read. I should have done it black, really, but I have a photograph of my Granny, and that was a favourite photograph. She had that displayed in her house. DS: Really? Would you like to read that out for us? GB: So it says, ‘April 2007. Granny’s in the Pink by Gill Biel. Dedicated to my dear Granny who lived 1884 to 1974.’ And I was a teenager when she, she died. And she lived in Yorkshire and she was an old lady, really, but I loved her to bits. DS: Our grannies are all like that. DS: Oh, right, a marriage that didn’t last perhaps. GB: I always remember her as that… dressed like that, really, in the, in the ’60s and ’70s, she always… but, no, I was very fond of my Granny. I mean, she, she, she taught me… she used to be a knitter. She didn’t actually sew very much, but she taught me to turn a heel on a… ’cause she used to knit my Dad’s socks. I remember we did a pair of doll’s socks when she came down the one summer to stay. She taught, taught me how to turn a heel. I wouldn’t be able to do it now, but [laughs]. DS: So there’s no quilting on this, because it’s so mu, so much embellishment, isn’t it. What, what different stitches have we got on there? DS: What’s this one? Is that, like, a shell? GB: Now that, that’s a version of Buttonhole, but it… I think it’s called Twisted Buttonhole. Some of them I tried out for the first time, you know, because I wanted… tho, those are all variations of Buttonhole stitches, there. That’s like a Fly Stitch, but with sil, silk ribbon. You’ve got… ooh, gosh. There’s all sorts, isn’t there? And that’s, that’s a, a variation of Buttonhole, Lazy Daisy again. DS: Yeah, what’s this one? GB: That’s, Feather Stitch, again. Yeah, not, not very complicated stitches. It’s just how… when you combine them with beads and buttons and things… ooh, what’s that one called? I’ve forgotten that. That’s, oh, that’s got a name, but I can’t remember it. GB: Yes, silk ribbon again, yeah. Like little flower buds there. Yes, yeah. DS: Like, like, tulips, almost, aren’t they? DS: So what sort of technique did you use for that? DS: You hand stitch it. GB: Yeah. No, you can actually see that it’s actually how many blocks? Forgotten now. It’s one, two, three, four, five by four, so there’s 20 blocks there, which means that you can sit and work on each one individually, so you’ve got 20 blocks, and then, then you join them together eventually. DS: And you did very well. GB: But I, I, I do think some of the old Victorian Crazy Quilts; they are made in one piece, if you know what I mean. They do literally start at the corner, or start in the middle and… it’s a modern way of quilting, isn’t it? Doing it in blocks, really. DS: Yeah. Perhaps an easier way, as well. GB: Yeah, maybe, yeah, it is, it is probably an easier way, especially if you’re sitting with it on your lap. You don’t want a great big quilt on your lap all the time, do you? DS: Perhaps not, no. So you said you made it for a competition would you like to tell us about that? GB: Yes. It was, the Sandown Quilt Show, which I’ve forgotten… is it called Quilts UK? Yeah. And that was in 2007, so I think it’s June. Yes, it is June, because it actually was on my birthday in June, and I won first prize, and I was so pleased [laughs] and they rang me up on the Friday, I think, to say that I’d won it, and we were going down for the weekend anyway. We were going down for the Saturday and Sunday, and stopping in a hotel on the Saturday night. So I went down on the Sunday for the prize-giving. DS: And what did you win? GB: It was a little pie… a little silver plate, actually and I, I tried to find it. I’ve put it away somewhere in my craft room and I’ve for… I’ve lost it, but… well, it is there, but I don’t… I couldn’t put my hands on it. It was just a little… and then there was at the time, I don’t think they exist anymore, there was an internet company who specialised in beads and buttons and embellishments. I think they were called Vic, Victorian Embellishments, or something like that. And there was a £50 gift voucher to spend with them. GB: So of course, I just spend it on loads more beads [laughs] for the next one [laughs] ’cause I did, I did do another one the year after, but I think, I think they only sponsored it for two years, and then that category went out of the… so I never did, never did another one. DS: And was that your first prize-winner? DS: So where, where’s this quilt kept now? GB: Well, it was hanging in my dining room, for, for qu, a few years until I decorated, but I decorated in colours that it doesn’t really go with [laughs] anymore, and then I, I put it up in my craft room for a while, and it has been borrowed a few times. People have taken it to various places and showed it off, but to be quite honest it is folded up and kept in a drawer now. I didn’t want to expose it to too much light, anyway, ’cause some of the fabrics are [phone rings] delicate. I told you it would go. [Pause]. DS: Continuation of interview with Gill Biel, 2016.026. So, how do you feel about this quilt now? What are your feelings? Memories? DS: Is it something that comes out when people come, family come? Is it something they, they like to look at? GB: Yeah, yeah, but [laughs] it is quite nice to be able to say that you won first prize at something. DS: Yeah, absolutely. So we’ll move on now a little bit, and talk about you, and, and your involvement in quilting. So how, how and when did you discover patchwork and quilting? GB: Oh, well, back, back in the ’70s, I suppose, really when I first discovered it. I mean, I’ve got, I’ve got an old book upstairs that was, I think was 1979 or something. I’ve forgotten the name of the author, but, I did actually make, a quilt from that for my s, first, for my first son who’s now 35, so that was 1981 when I made that. But of course, you couldn’t get the patchwork fabrics that you can now. It was all Laura Ashley then, so I actually made it in alternating pink and blue Laura Ashley fabrics, ’cause obviously I didn’t know I was… whether I was having a girl or a boy and I used it for all three of my sons, and I actually lent it to my sister when she had her two daughters as well, so… and it’s on, it’s on the… I got the crib out just recently, ’cause obviously I’ve got grandchildren now. DS: Oh, so you still use it today? GB: And it’s on the crib upstairs, still, the one I made in 1981. So that’s a Puff Patch work. DS: Puff… so what’s Puff Patchwork? GB: It’s, again it’s not traditional quilting or patchwork really. It’s two pieces of fabric. The top fabric is bigger than the bottom fabric, so that you can actually stuff it with wadding, and it creates a, sort of, puff ball, which you then, and then you sew however many of those up that you’ve made. DS: So they’re done as individual blocks, are they? DS: But you’ve got the other first one you made. DS: So, so you were self-taught? GB: I self… I’ve been self-taught all my life, yeah. I started dressmaking when I was about ten. I mean, before then, I’d probably, like, made dolls clothes and my mum taught me to sew, and my had… we had a hand Singer sewing machine, which I do remember putting my finger under once and getting the needle through my finger when my mum was sewing. That wasn’t a very pleasant memory, in fact I can still feel it now, when I talk about it. So I always watched my mum sew, and then I, and then my sis, my sister was born when I was 11, so it was like having a real doll to dress up, so I really honed my dressmaking skills on my sister, ’cause I used to make all these pretty little toddler dresses and trim them with rick rack and lace and all sorts. GB: I know. I started… yeah. ‘Cause I used to love to put… that’s… I’ve always loved that, in fact, I’m always a bit impatient to get together, even now, when I dress-make, I’m always thinking about how I’m going to finish it off, and somehow the, the making of it is secondary, do you know what I mean? Because I want to finish it, to put nice buttons on it, or put, put some embellishment on. But yeah. DS: So was dressmaking just a hobby? GB: It was a hobby and then after a… when I left w… I used to work in a drawing office, but I didn’t go back to that after the boys were born. I decided to, when they were, you know, well, when Robin, the youngest, was about three, I started to think, ‘Oh, what am I gonna do work-wise now? I need to…’ so I actually went back to college. In fact, no, it was before Robin was three. It was probably when he was a baby. I went back to college and did City & Guilds in dressmaking, in order to be able to teach it, just, just at evening classes, and that’s what I did. DS: So after that, you went back to, to college as a teacher. DS: Do you still dress-make today? DS: Have you done anything special? GB: Oh, yes, I’ve done loads of special things. I made my own wedding dress, actually, and four bridesmaids’ dresses in the ’70s. I’ve made my, both my daughter-in-laws’ bridesmaids dresses, ’cause they’ve got married in the last few years. I made four bridesmaid dresses for Annie, and six bridesmaid’ dresses [laughs] for Jodie. DS: Gosh, you kept busy. DS: So has dressmaking taken a back seat to the quilting, or the other way round? GB: It did for a few years. Yes. I must admit once I started quilting I w, I was, sort of, made on it then, but I suppose my dressmaking skills helped me with the patchwork and quilting, ’cause I didn’t, didn’t have to learn how to sew. I already knew how to do that. So I suppose for the last ten years, quiltmaking has been a passion, and yes, I supp… I, I stopped dressmaking really when fabric… when you… you, you can’t get the fabrics you used to be able to get, and sort of, 15 years ago, maybe, clothes started to be so cheap. ‘Cause I used to make them in the ’70s for myself because I couldn’t afford to buy clothes, ’cause clothes were expensive, but then, of course, you’ve got Primark and Matalan and all those places. Clothes are so cheap now, that in actual fact it’s more expensive to make something, so you probably only make things for special occasions now, rather than just utility clothes. DS: Clothes, clothes are more disposable today, aren’t they? DS: I mean, perhaps we won’t see fabrics used in them today put into a quilt like this in a few years. GB: Oh, no, ’cause they won’t last, will they? And also, there won’t be the offcuts that people used to have from. .. I mean, I do regret, in a way, not keeping all the offcuts from, like, the clothes that I made for my sister in the ’60s and… it would have made a fantastic quilt, wouldn’t it? But you can’t keep everything, can you? Yeah [laughs]. If you did, you’d never get in the house, would you? DS: So you have a sewing room? GB: Oh, yes, I do now. Now all the boys have left. I didn’t, for many years. It was always perched on the kitchen table, or… I did have one. I did have an old Singer sewing table, you know, that used to be a treadle, have a treadle machine in it, but I used a modern machine on it, and it was like a piece of furniture that we had in the living room, and when the boys were little, I used to remember, if I was sewing, and they were watching television, and I, like, put my foot on the pedal, and they’d go, ‘Mum, Mum, we’re trying to listen to the tell…’ so I’d to wait until there was a noisy bit on the film, and then put my foot on [both laugh]. So I’ve sewn, you know, as… because obviously, having three boys, we never had much space. No spare bedrooms or anything. And then, and then when my, when my middle son left, ’cause his bedroom is downstairs in… where the dining room is now. I turned that into a craft room as soon as he left, and he said, ‘Well, I’m never coming back home now [laughs] am I?’ But I have… I’ve actually got… now, now the last son’s left, I’ve actually turned his bedroom into a proper sewing room. I’ve got a proper table and everything. DS: And do you spend much time up there? GB: I’m al, always up there [laughs]. I spend more time upstairs than I do downstairs. Yeah. DS: You always know where you are. GB: Yes. I’m… even if I don… if I’m not sewing, I’m tidying it up, or moving things round, or finding new containers to put things in, and just sorting out. DS: Yeah. It’s more than a hobby, then. DS: It’s a way of life now. GB: Yes, it is, yes, yes. I couldn’t imagine… in fact, I couldn’t imagine a day going by without doing some sort of sewing activity, even if it’s just looking at it. DS: Yeah. So what type of sewing machine do you have? GB: I have a Janome six, memory craft six six double-oh, which is a professional one. It’s a m, a metal bodied one. Quite expensive. Well, it was expensive at the time. I think they’re, like, about £1200 to buy now. And it’s a real workhorse. DS: And how’s that turned out? GB: It’s not quite as satisfying, ’cause you have to sit over a sewing machine, obviously, and, like, part of the pleasure for me is sitting with it on your lap, and doing the slow se, sewing. And I get… I actually get quite annoyed when I’ve finished something ’cause of what… ’cause it’s the… often the finished article isn’t what I want. It’s, it’s the actual doing of it, and that, that’s the pleasure. DS: Yeah, the evolvement of it. DS: Do you give many of your quilts away? GB: Well, I have recently, ’cause I’ve got two grandchildren now, so I’ve made each of them a, a quilt for their cot, and each of them a quilt to lie on, on the floor, and no doubt, as they get older, they’ll have them for their beds, and the walls, and [laughs]. So [laughs]… bags, and nappy changing things and… oh, I’ve made two big nappy bag… you know, the, nappy changing bags and yeah. DS: So you still make quilts today. GB: Yeah, yes, yeah. I’ve got one on the go at the moment. DS: Can you tell us what Pinterest is? DS: So, just to tell us, what a Foundation Quilt is. GB: Well, again, that’s, that’s quilting usually through paper, so if you’ve got a computer and a printer, you can print a block off on a piece of paper, and then you sew your fabric over the top of the paper, and then rip the paper off underneath, afterwards. So instead of having to make fiddly little templates and fit corners together and put seam allowances on, which, you know, is not my type of, you know, quilting, you’re sewing it all over paper, and you get nice precise points and, like I say, again, it’s something you can print off the computer and… so you could find a Foundation Block that you like and print it off, and then use it. DS: Yeah, so technology comes into your quilting life quite a bit? GB: Oh yeah. Yeah. Oh yeah. Yeah, I’d say I was an avid user of technology. DS: Do you have any sites that you particularly use on the Internet? DS: So what… we go back to you… going back to your fabrics, do you, do you buy a lot of commercial fabrics, or do you do any hand dyeing, or…? DS: Is there, is there any particular brand of fabric that you prefer to…? GB: No, no, to be quite honest. I’ll just I, I’m not loyal to any brand at all. I just go in a quilt shop, and if I like it, you know, I will buy it. DS: So where, where, what quilt shops do you use? Are they local or do you tend to use the shows? GB: Yes, yes. I do use the shows a lot, quilt, for, especially for dressmaking fabrics. You just can’t buy dressmaking fabrics anymore. There’s very few dressmaking shops now, and there’s l, lovely stands at, at the shows, which I tend to stock up on quilting fabrics, though, we have got a couple of local quilt shops. We’ve got Windsor Crafts, which is, oh, less than a mile away, and they’re, they have quite a good range, and I have a friend who used to have a shop, but now keeps them all at home. GB: So, she, she’s quite good for, like, utility fabrics [coughs] and I do travel to quilt shops. I’ve gone over to the Cotton Patch in Birmingham, and I’ve gone to the one in Newport, which I can’t remember the name of. GB: ZigZags in Newport, and sometimes I like combining it as a day out, so especially if we go away for the weekend, or we go away for a few days, I’ll, sort of, get on the Internet, to whatever town we’re going to, and look to see [laughs] if there’s a quilt shop, a fabric shop, a dressmaking shop, a craft shop, in that area, and we’ll u… we’ll, sort of, combine it as part of the holiday. I… even when we went to, Belgium, I had to look, and I found a quilting shop in Bruges, and we walked all these side streets to find it. DS: It takes you to places you’d never go to. GB: [laughs] I know. I know. Actually, yes, it’s a hobby that… but, but… yeah. It, it’s finding things to do, isn’t it? ‘Cause sometimes, you know, you walk round a town and yes, it’s nice to look at the architecture, nice to look at museums and that, but it is nice to explore the side streets as well, and often these little shops are in side streets, aren’t they? DS: Yeah, and you meet people that. DS: Something that you wouldn’t do in Sainsbury’s. GB: Well, you wouldn’t, no. No. And of course if they… I mean, I’ve, I go in when… I’ve been in Windsor Crafts many times and, sort of, know people and nodded at them. If they’re choosing fabric, they’ll ask your opinion and they’ll say, ‘What… do you think that green goes with that blue,’ or, ‘What, which one do you like the most?’ [Laughs] And you sort of give your opinion, don’t you? DS: Do you have a particular palette of colours that you real… you prefer or does anything go with anything? GB: I suppose I do tend to go for the pinks and purples, though saying that, you know, I have made quilts in other colours, but I, I do, I do like those… I like, I like the muted colours as well. I don’t, I’m, I’m not a great one for bright colours, but saying that, because I’ve now got grandchildren, it’s actually been quite pleasurable to look for novelty fabrics, which I never looked at before. I mean, some people are mad on novelty fabrics, but I’ve never really been that keen, but now, I’m starting to think, ‘Ooh, you know…’ I’ve just made a circus-themed quilt for Freddie [laughs] ’cause, ’cause, well, Annie’s really into D, Disney, so she wanted some sort of Disney theme, so I’ve done, like, elephants, like Dumbo, yeah, elephants and found all this elephant fabric, but then I found some circus-themed fabric at the show,, last show that I went to, and it evolved from there, really. So, you know, I would never have looked at novelty fabrics before, but now, of course, it’s… now I’ve got grandchildren to quilt for [coughs]. DS: What point? Tell us about ‘en point’. 0:47:09 GB: That’s where it’s not square. It’s like a diamond shape, isn’t it? So… and then you fill the corners in with triangles to make it into a square, and then I found this elephant fabric which I used for the borders, and this circus fabric which I used for different blocks. DS: Brilliant, so that, that, you’ve got your quilt, put, quilt top put together and you layer it up? GB: And then I layered it, and then I backed it with… I found some elephant fabric again [laughs] so it’s backed with elephant fab… so very much an elephant theme, but that, say, that’s because of Dumbo that… she’s really mad on Dumbo so, yeah, so that, that w, that was good, but there’s. DS: And how, how have you quilted that one? 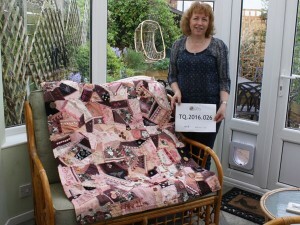 GB: I quilted it on… I’ve got a quilting frame which fits onto this purpose-built table I’ve got in my sewing room now. Putting the machine on the quilting frame, and I did it… no, I didn’t stipple that… sorry, what is it? Is that Stipple Quilting? No, what’s it called when you do random… yeah? DS: Better say, what vermicelli is. GB: [Laughs] that when you’d… When you… it’s, it’s… yeah, no, yeah, I know, it’s got the same name, hasn’t It? It’s when you, well, what did Kate describe it as? Taking a line for a walk, isn’t it, where you just move the machine in random, sort of, curvy patterns, all over the quilt, ’til it just covers all the entire surface. So, but, thinking about it, I don’t think I did that pattern. I did a loopy pattern, so I just, like, random squiggles on the… but when you use a quilting frame, you can do that, because you’re moving the machine rather than the fabric. You can actually do more, sort of, random pattern on the quilting. DS: And I that how you quilt all of your quilts now? GB: Again, because I like to do things quickly you know, the, the, the quilting part anyway, and I’m not parti… I don’t think I’m particularly good at moving the fabric. I tend to get, sort of, like, skip stitches and long stitches underneath. I find it much easier to control when it’s on a quilting frame. So that’s how I tend… if I’m doing a big quilt, that’s how I tend to do it. I’m not a hand quilter. Even though I love all this embroidery and that, I’m, I couldn’t bear the thought of doing a bed-sized quilt by hand. It would just bore me, I think, if I… I’d probably start and do about 12 inches [laughs] and I don’t feel as though I can get the stitches as even on the bottom as you can on the top, whereas with a machine, with a machine you, you’ve got this, the evenness of the stitch, haven’t you? DS: Do you have, ever have any of them professionally quilted? GB: No, I’ve never done that. I know that they do look beautiful when they are professionally quilted, but I’ve never, I’ve w, I’ve watched them in the shop. I’ve been down to the Bramble Patch and gone in the back room where they do the quilting. It’s fantastic, isn’t it, how they do them now all computerised and… in fact, they don’t have to do anything once they’ve loaded the quilt in, do they? DS: You mentioned workshops earlier. DS: So, what workshops have you attended? GB: Oh, gosh. I can’t remember them, all the ones I’ve done. Done quite a few from Wombourne Quilters, so Saturday workshops. 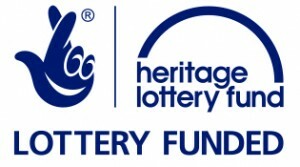 We did one with that… with the lady from ZigZags, didn’t we, in Newport, the lady that did the foiling, just recently? DS: So that’s foi… using foil on fabric. GB: Using foil on fabric, so it was, like, rubbing, like, well, it’s, like, silver and gold, different coloured foils and you rub them on the fabric and then quilt afterwards, but I’ve forgotten her name. She came and gave a talk. It was rather a… you can’t remember her name eith… no, and then I’ve… what else have we done? We’ve done Linus quilt days, workshops for Linus quilts. I suppose I’d better explain what a Linus quilt is. DS: That would be nice, yes. DS: Quite a nice story, that is, isn’t it? DS: Yeah, so do… you mentioned Gillian Travis. Is there any… do you vi…, attend any quilt shows now, to, to view the quilts? GB: Yes, I always go to the quilt shows. Yes. DS: Which ones do you go to? GB: Go to the NEC Quilts UK, is that called? Festival of Quilts, that’s it, yeah, yeah, at the NEC in August. That’s the… I think that’s the biggest in Europe, now, isn’t it? Yes. And I probably usually do two days, ’cause it’s such a big show that you, you can’t do it in one day, not if you want to shop as well. And I have, I have done workshops there as well. A couple of years ago, I did an all-day workshop with, at the Festival of Quilts. Again, I can’t remember the, the young girl’s name, but we did, it was an embroidery one, really. It was a… doing Redwork, a Redwork picture from a photograph, and I did a, I did a picture of my cat, which is in the kitchen, so I did finish that one. I’ve done some of the mini workshops there as well. I did one with a lady from Vilene, from the Vilene counter. We did, like, a little appliqué picture. I did one with a, a foreign lady. I think she might have been from Belgium, where we did, again, appliqué picture, but using bits of paper and all, all unusual objects, and, and doing a little… I must admit, appliqué is probably one of the favourites, yeah. I do like to, like to do appliqué. DS: Yeah. Do you spend much time looking at the quilts at the Festival of Quilts, or, like, shows? GB: I do, I do, yes. Sometimes it gets a bit crowded, though, doesn’t it? GB: And it’s a lot to take in, as well. And you have to, like, I think I find that I choose maybe a category, that I’m particularly fond of, and look at those quilts more, so bed quilts to me are my favourite category, whereas I’m not that bothered about maybe the 3D stuff, or the tra… I li, I like the traditional stuff, and I like, I like some of the contemporary stuff, but I think it can be a bit arty sometimes. It’s not what I would call quilt making. It’s more art. DS: It’s not what you think of as a quilt? GB: No, no. Which is why I like what they call modern quilts now because that’s almost like the traditional, but using, maybe, more modern fabrics, and more modern techniques. So if I’m… if anything, I would say I was a modern quilter. You know, if I, if I do things for, like, bed quilts and that, because some of the traditional stuff is a bit old fashioned now, I think. So I, I like what some of the more modern, younger quilters are doing. DS: Yeah. Have you ever exhi…, as, exhibited at the Festival of Quilts? GB: No, well, yes, Sandown I’ve done twice, or three times, I think. I did, I did Malvern. I d… I put a quilt in at Malvern once. Oh, and, and, when, before the quilt show at Uttoxeter, moved to Uttoxeter, when it used to be Trentham Gardens, I put, I think I did three years of a quilt there as well, in Trentham, maybe one in Uttoxeter, but I haven’t done… I haven’t put a quilt in now for about three years. DS: Do you enjoy entering competitions? GB: I do, I do. I do. But it’s quite stressful when when you, sort of, put something up, ’cause you have to be prepared for people analysing it. In fact, when I put… I remember when I put this crazy quilt in at Sandown, I sort of hung about in that area, ’cause you want to hear what people say about It, and it’s really quite, sometimes, people say really nice things, but some, sometimes people can be quite cruel, but I rea… oh, and we, I think we had a little Wombourne Quilters exhibition in Trentham once, as well, called ‘Memories’. We all had to put something in for ‘Memories’, and I put this, this one in, and I remember standing near the stand and heard one woman coming in went, ‘Oh, my God, that’s really OTT’ [laughs]. So, [coughs] so you have to be prepared to, to maybe take a bit of criticism as well. DS: So when y, when you, when you were visiting the quilt shows and looking at quilts, what are you looking at what are you looking for in quilts? GB: I don’t know, because I can actually walk down a line of quilts, and probably not look at most of them, and then suddenly something’ll just take your eye, won’t it? I don’t know what you… I… you can’t really put your finger on it, what it is, but you can walk down a line and think, ‘Yeah, yeah, that’s nice,’ and you can appreciate all the work that’s gone in it, and then sometimes, you do look at a quilt and think, ‘Whatever was the maker thinking about when they put that together?’ Maybe it was, you know, the colour in their bedroom, or… so it’s obviously, you know, but I’m always amazed at what people do, because you think, ‘How did they come up with that idea? Why have they done that? Why is it like that? And you… ’cause you can’t get into their mind, can you? Which is why I like, I do like to read sometimes about what their inspiration was and, and then it sometimes clicks then, and you think, ‘Oh, yeah, I can see it now,’ but when you actually just look at it without reading about it, you think, ‘I don’t know why… why did they do that? Why did they put it together like that? [Laughs]. Why did they use those colours? Especially if they aren’t colours that you particularly like. DS: No, that’s right. 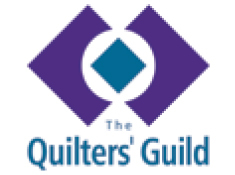 So you mentioned Wombourne Quilters. Are you a member of, quilt groups locally, then? GB: Yes, yes, I’ve been a member of Wombourne Quilters since… I was trying to work it out, whether it was 2005 or 2006. I think it was 2005, ’cause I was working out how old Robin was when he left school. So I’ve been a member there, but I’d always, I’d, I’d sort of known about them for a long time. I’ve, I’ve known about them, you know, for 20 years before then. Part, partly because I went to an exhibition of theirs years before I actually joined at the Wodehouse in Wombourne and it was a beautiful exhibition, I loved it. And it was a really old house, which… I really love old houses anyway, and they’d got all the quilts draped over the, like, the bannisters and draped over these chairs, and hanging in the, over the fireplaces of this house, and, um, it, I thought, ‘I want to join that group, wh, when I can,’ ’cause I think the children were still quite young then. You now what it’s like when you’ve got young children, you can’t even think about going out one night a week. There’s always something to do, isn’t there? So I did put it in my mind that I was always gonna join, and then, as I say, when, when all the children had, sort of, left school, I thought, right, this is it. It’s time for me again, now. DS: Are you a member of any other groups? GB: I’m in a group that meets in Bilston, called the Bilston Textile Group, and that… but that only meets once, once a month. But that’s more, not just about quilting. That’s just about any sort of textile artwork, really. I’m also in, well, I also teach once a month. Sort of, well, I help somebody who teaches once a month at a little local group in a community centre, but again, that’s… I just like helping out. I like, I like seeing what other people do, and being able to help them. GB: No, it’s not quilting. It’s an, anything. It’s dressmaking, embroidery, quilt making, anything to do with textiles, again, that people want to make. We just, we just help them out with it, and help them do it. DS: Mm. Is it well supported? Do you get many people coming along? DS: I was going to ask you, what do you enjoy about being a member of a group? DS: So are you an active member of the group, or do you just go along to meetings? GB: Oh, no, I am an active member ‘cause I’ve been on the committee now since probably the year after I started [laughs]. I suddenly found myself volunteering, as I do. So I have been, yeah, I’ve been on the committee as the secretary, the programme secretary, the treasurer, and now I think I’m just general dogsbody. But yes. I enjoy being on the, on the committee as well. DS: Good. That’s lovely. I’ve just got one, one question to ask you now. What, why is quilt making im… an important part of your life? DS: Well, that was lovely, Gill. Thank you very much.